I’m still pretty jazzed up about the Hubspot Inbound 2014 conference that I attended this week. A lot more to come on that over the next few weeks. The big reason for my excitement (apart from seeing so many sales friends) is that Hubspot has joined the CRM game and is looking to help sales people succeed through social selling. In this vain, a lot of good stuff pouring out of Hubspot right now on sales. First stop check out the report below. Here’s some of the Hubspot post announcing the report. If you know HubSpot primarily for its marketing software and content, you probably already know that we’ve recently released our sixth annual State of Inbound Marketing report. You might also know that this year, we dropped “Marketing” from the title, and have rebranded it simply The State of Inbound. Because one notable finding from this year’s report is that inbound methodologies are being used to power not just Marketing, but Sales, too. 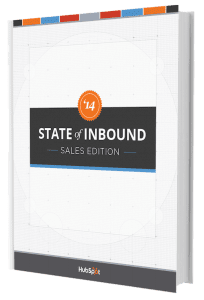 With the growing prevalence of the inbound mindset among today’s sales reps, growing alignment between Sales and Marketing teams, and our own release of the new HubSpot Sales Platform, we thought it appropriate to publish a sales-specific edition of our annual report — our first annual The State of Inbound: Sales Edition. 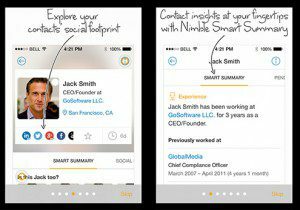 New Nimble app–much needed. Thanks! 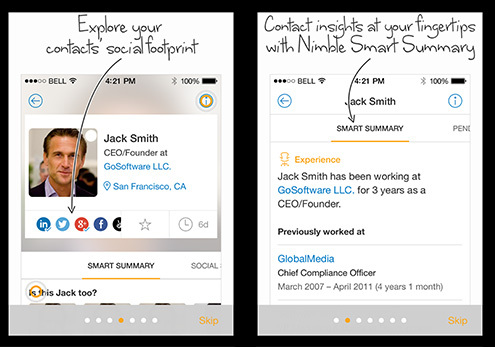 Nimble announced today it has released a new app for the iPhone. This very good news. Well now I can…on the new app. Yeah! It’s always pleasing when things happen on my schedule (not too often)! If you’re into social selling and have not checked out Nimble, you should. I run my Rolodex from it. 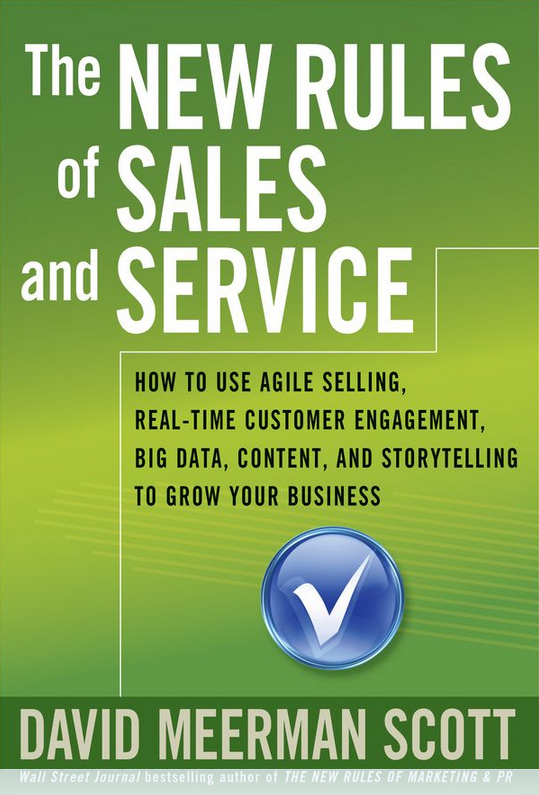 It’s the CRM that best aligns with a social selling approach (that I know of). A story from my consulting work. I thought it would be a good idea for my client to see if they could sell more to their existing top accounts (I’m quite the strategist you will note.) The first step to doing this was to get a list of those top accounts. After playing with the client’s accounting software for a fun few hours I managed to get a list of their top 100 accounts by revenue for the last year. Opening this list I thought I’d take a look at how their sales coverage was on account number one. What had they done to sell more to this top account? 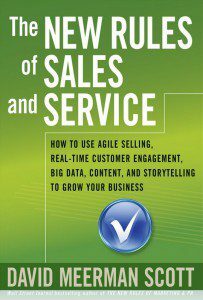 I was working a hypothesis that my client’s sales people were mostly selling their main products not all their products. I thought there might be room to boost revenue by selling more to their strongest existing clients. I jumped into the client’s CRM system to see what notes lay in there. Which contacts in this top account had been spoken to; met with; and what other activities had been completed? One thing I found in the CRM system was the name of this account’s head of marketing. So then my habits kicked in. I typed this head of marketing’s name into Linkedin. But he was hard to find. I typed in his name and the name of this account into Linkedin’s search function. I did not find him. Then I searched by the account’s name and the word “marketing”. He did not come up. So then I searched Linkedin by only the account’s name and waded through pages of employee profiles. Still the name of this head of marketing did not come up. Finally I just typed his name into Linkedin (without the account name) and got a bunch of profiles (luckily his name was not “John Jones” but it was not that unique either). After a lot more time wading through profiles I finally found him. You may have guessed by now…he was no longer at the company per his Linkedin profile! He had left a year ago. So next I typed in just the title “VP Marketing” and the account’s name into Linkedin and came up with two people – one who literally had the title “VP Marketing”. I like to cross check such findings. So I looked this guy up in Insideview and found that he was also listed there as the VP Marketing for this company. Admittedly this was on odd situation where the sales person did not know who a key contact was in such a key account. The account had changed hands as a sales person had left. The new sales person had been told by someone at the company who they should talk to. But that person was not the head of marketing – more of a gatekeeper. And the sales person (here’s the key) never investigated any further. Even though they could have found out in 15 minutes by searching Linkedin, Insideview or Jigsaw – like I did. I admit I’m a crazy fan boy of Sales 2.0 tools like Linkedin, Insideview or Jigsaw. But as this story illustrates these are valuable tools. These tools are massive repositories of information on companies and they are available right from your desktop. They are very low cost or often free. But the information you can get from them could make a huge difference in your commissions. Not using them to cross-check/update account information seems like looking a gift horse in the mouth to me. What do you think? Over the years of sales consulting with companies of all sizes (many ironically in IT), I’ve seen some darn ugly CRM databases. Back in the first days of this blog I compared these databases to a 2-year-old’s bedroom (in fact I should have said a 4-year-old’s bedroom I believe having now passed through that milestone for real). Being an atypical sales dude (a self-described sales geek in fact) I have always been rather type A about keeping my own CRM databases spanky clean. This has resulted in an incredible amount of ctrl-c/ctrl-v actions on my keyboard that have worn down several keyboards and probably set me on the way to carpal tunnel. Well, finally there are some new-fangled CRM’s that seek to address the lousy-data-in-the-database problem and the too-much-typing problem. I thought I’d start sharing my thoughts and experiences with the ones I’ve been allowed to play with so far. The first one to tell you about is one I’ve been playing with for the last two weeks and I have to say I am quite enjoying the experience. It’s called Nimble. A key feature with Nimble is that when you enter a new contact in to its database it does a nice job of going out to Linkedin, Twitter and Facebook and pulling down all the profiles for that person from these social networks (I’ll cover other tools that do this too in future posts) – with minimal typing involved for you. Once you set up a contact there’s a nice display of all the communication you’ve had with them right on their contact record: email, Linkedin, Tweets and FB updates. This will be increasingly helpful as people choose which “channel” to communicate on and communication gets more-and-more fragmented. You can also see all your inbound communication in one place: all your email, all the Tweets featuring you, all your Linkedin messages and invites. This makes a lot of sense but I found in my testing so far that there is something about the user interface here that needs some refining. I’ve found myself dropping back to my Gmail inbox most of the time to see my emails. The final tab on Nimble shows you all the activity from all your contacts and that seems quite promising too but right now I’ve been too busy cleaning up all my contacts to really get value out of this area. What I have gotten great value out of is Nimble slapping me in the face and reminding me of who I am connected to on Linkedin that I don’t really know and should either get-to-know or disconnect. I’m amazed by all the people that are dead-ends in my Linkedin network and now I am actively working on that. I suspect there’s a huge ROI just in this lucky side effect of using Nimble. I’ve spoken to Nimble about their plans and it seems there are going to be lots of add-on modules down the road that will provide additional functionality to what is currently a fairly stripped-down CRM. For example, right now there’s no reporting or opportunity management but that stuff will probably come soon. I’ve found myself keeping my Zoho running for that “old fashioned CRM stuff”. I’ll be talking soon about other tools that take this kind of “real world” approach to CRM (“Social CRM” is the hot jargon) so please do let me know about your favorites (or the one your uncle is selling). I am a natural geek so playing with these things is more fun for me than tidying up my six year olds’ bedroom. We still don’t spend enough time on figuring out who to call.I’ve been talking to a few business owners this week about how to develop their business. We’ve talked extensively about prospecting and it keeps striking me that the #1 ingredient to successful prospecting for them is going to be the quality of their prospect list. The tough part about having a great list of people to call is it takes a lot of work. A great list is like love – you can’t buy it! Going out to list brokers or online systems (even the “Sales 2.0” ones like Jigsaw or Spoke) won’t get you a list that will perform that well (although you can start there). Lists need a ton of cleaning and nurturing — constantly. Only after you’ve spent a lot of time and effort defining the profile of who you need to call. And spent tons of time on cleaning your list. And then spent ages on calling people and nurturing the heck out of them, will you have a list that you will start to appreciate…your “house” list. You can’t buy a list that will work well. You have to develop it with love!